In the world of agglomeration equipment, the disc pelletizer (sometimes also called a pan pelletizer) is often chosen for its ability to fine-tune product size and create a refined product, the process of which, is a combination of both science and art. The pelletizer offers several variables, all of which can be adjusted, and work together to produce the desired pellet product. Disc pelletizers can be used to process a wide range of materials, from chemical powders, fly ash, and coal fines, to minerals and ores, fertilizers, and more. 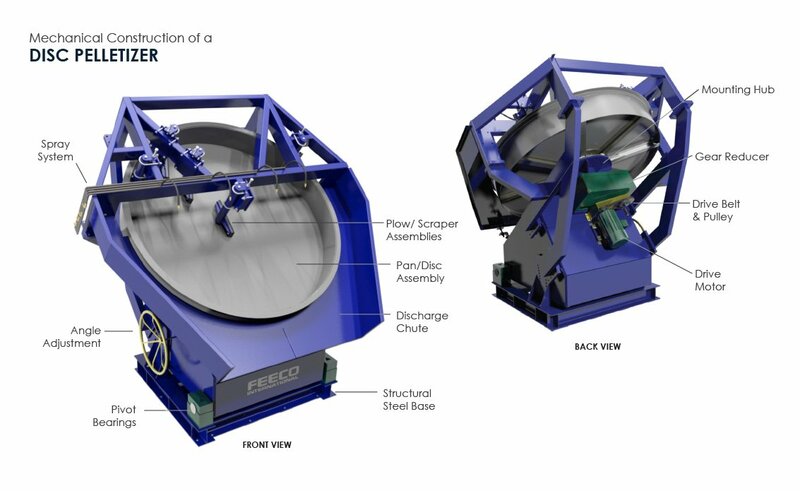 3D Disc Pelletizer with Labeled Components by FEECO International (Click image to view larger). How Does a Disc Pelletizer Work? Disc pelletizers are a non-pressure or “tumble growth” agglomeration device. They may be used alone, or in combination with a mixer, commonly a pin mixer. Material is fed onto the disc/pan, where it is taken up by the rotation. As material is wetted at the startup, a coating will form on the pan. This coating prevents water from coming in direct contact with the pan, which would cause mud to form on the plows, creating very large, uneven pellets or lumps. Once the material is fed onto the pan, centrifugal force causes different sized pellets to self classify on the disc. The small seed pellets find their way to the right, and as they grow, work their way to the left, where they are eventually discharged at desired size (See diagram below). This diagram shows a typical pelletizer setup, as well as the pattern of classification of pellet size that typically occurs. What Causes Seed Pellets to Grow? Droplets of moisture will collect several particles, and the rotation will impact and densify this loosely formed nuclei or seed. This densification forces water to the surface, where it can pick up more particles. The continuous rotation of the pan causes the seed to recycle through the spray area, being re-wet, and picking up more particles, and so on. The interstices, or spaces between the particles, are filled with smaller particles, and the interstices between those filled with yet smaller particles, and so on and so forth. Surface tension and the capillary forces of the water are the binding force that holds the pellet together. In this case, where water is the primary “binder,” drying the pellet will accordingly drive off strength. 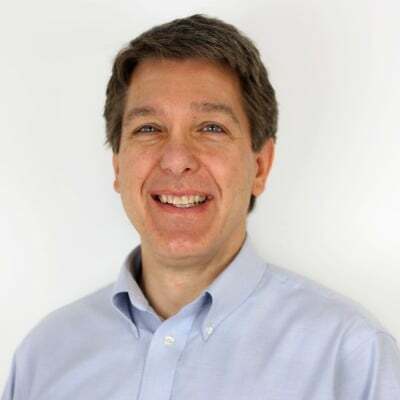 However, feed material is often made up of several materials, some of which, in the presence of water, will dissolve and react with one or more constituents, resulting in excellent strength. In addition, binding liquid can be tailored to cause binding reactions, or merely contribute adhesiveness. As stated, centrifugal force causes the pellets to self-classify themselves based upon size. This can be seen in the diagram below, where the first stream of seed, or nuclei is on the right, and as you move from right to left, the pellets grow, but are still somewhat segregated in streams. The pellets remain on the pan until they reach the absolute left side, where they have reached desired size and are discharged from the pan. The diagram shows the most common spray locations on a pan. 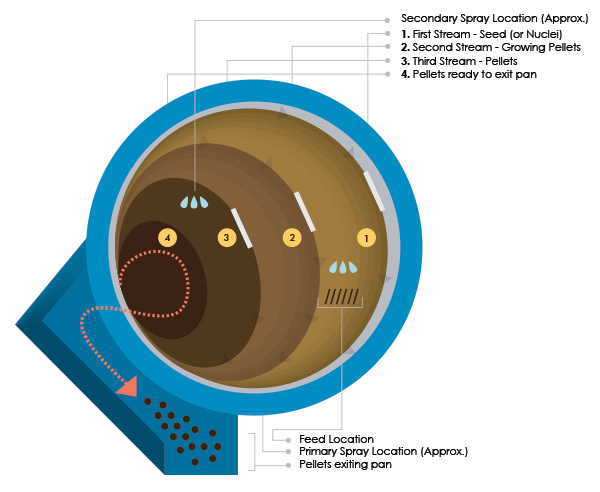 Adjusting the location of the spray will also affect the size of the pellets, depending on the material. The plows on the pan serve to remove build up. 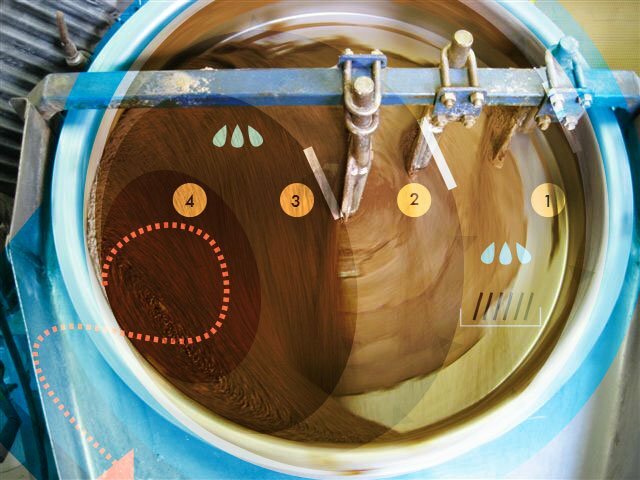 When a liquid is sprayed onto the disc and mixes with the powder feed, buildup can start to occur on the pan bottom and side wall. This buildup has to be removed, or the process won’t work correctly. The plows, or scrapers, remove this buildup and create a smooth surface. They also help direct the pellets into their separate streams. In order to maintain product size and quality, feed rate to the pan must be constant. Feed rate must be a constant proportion of the amount of water needed to produce the desired pellet size and quality. Any upset in feed will result in an upset of product. For this reason, a pelletizer must be closely monitored. Angle and speed of the pan are also factors that can be adjusted for customization. Angle of the pan is adjusted by a jack located in the back of the pelletizer. To an extent, angle and speed adjustments are complimentary. When the spray system is off, material should tend to cover the entire pan, and the minimum pan speed is that required to carry the material high enough for full pan coverage. Because of this, the steeper the angle of the pan, the faster the required speed is. A higher angle will result in less retention time on the pan, yielding smaller pellets, and a lower degree of angle will result in more retention time on the pan, yielding larger pellets (pellets have more time to go around the pan and collect more particles). Speed is the least important variable, and is used only along with angle adjustment to obtain optimum material coverage on the pelletizer. The pelletizer is an incredibly useful tool in the field of agglomeration. The opportunity for adjustments and customization allow for fine-tuning and customization which can yield an extremely high quality product. FEECO has been a leader in the agglomeration industry since 1951, manufacturing custom disc pelletizers for a wide range of materials. We offer a unique testing facility where we can test the feasibility of pelletizing your material at both batch and pilot scale. For more information, contact us today!